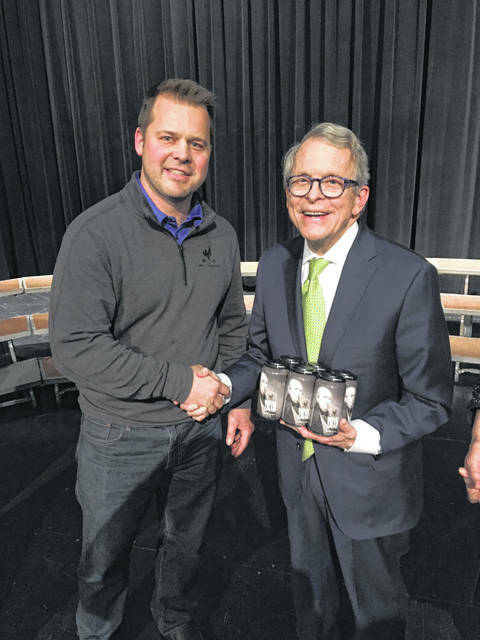 Moeller Brew Barn Brewmaster Nick Moeller recently presented Shelby 1819 Limited to Governor Mike DeWine. Moeller Brew Barn Brewmaster Nick Moeller congratulates Dave DeVelvis for naming Shelby 1819 Limited after autographing a can of the recently brewed beer. DeVelvis submitted the winning entry for the beer in the contest sponsored by the Shelby County Bicentennial Committee. 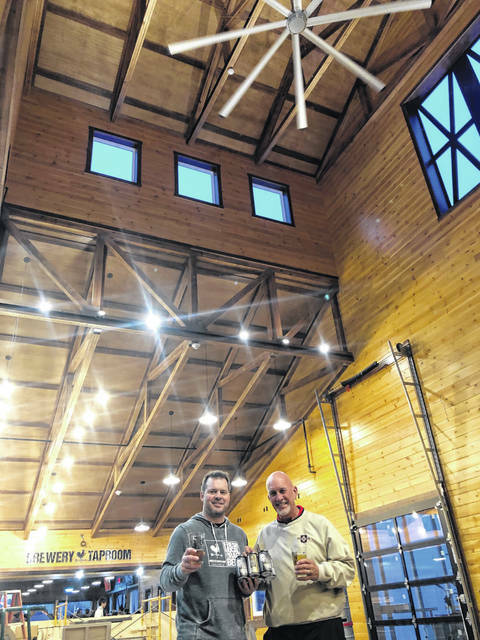 SIDNEY — Moeller Brew Barn Brewmaster Nick Moeller has announced that beginning Wednesday, April 10, Shelby 1819 Limited, the beer specially brewed in celebration of Shelby County’s Bicentennial will be available for sale in limited quantities. The first case of the beer was presented to Sidney resident Dave DeVelvis, whose entry was chosen as the name for the beer. It is being distributed throughout Shelby County, and will be available for retail at various locations. Although this is likely not a complete listing, it will help those who have been searching for the beer find it. Retailers that will carry Shelby 1819 Limited include The Bridge Restaurant, Karoc Marathon, Wagner’s IGA in Fort Loramie, The Hideout, Meyer’s Tavern, Anna Market, Mully’s Drive Thru, Patrick’s Pub, Al’s Place, Ernst Service Center, North Loramie Drive Thru, Keyhole Pizza, Meyer’s Garage and Drive Thru, Morrie’s Landing, Buschur’s Market, Gallery 2:Ten, Moose Lodge 568, Checker Flag Drive Thru, Buffalo Wild Wings in Sidney, Fricker’s in Sidney, Out West Drive Thru, and The Inn Between Tavern. There will likely be other locations as well that are not listed. Shelby County Commissioner Bob Guillozet and Shelby County Bicentennial Committee co-chair agreed. Shelby County Commissioner Tony Bornhorst, who chaired the Bicentennial Beer Subcommittee, also agreed. “Given the fact that Nick’s never brewed a pilsner before, I can’t believe that his first attempt was a home run. This beer is really great!” said Bornhorst. Shelby County Bicentennial Committee Chair and Sidney Mayor Mike Barhorst echoed his enthusiastic agreement. The beer has an alcohol content of 4.7 percent. The beer is intended to be available only during Shelby County’s Bicentennial year-long celebration.